Erin, you’ve got to make this into a dress/skirt/sarong/whatever ASAP and wear it to your next conference where your friends can scribble their thoughts, etc. into the little balloons with a water-proof marker, of course! Brilliant. Gosh, it’s like a wearable high-school yearbook. Instead of autographing pages, you do the same to an outfit and *so much more fun. * I may have to do this myself…. 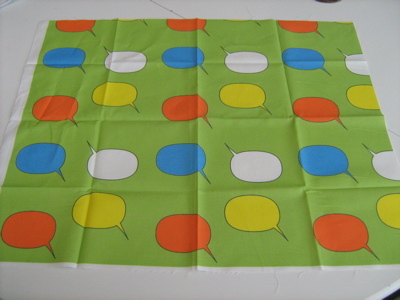 I read about Spoonflower over on http://www.trueup.net (a blog all about fabric). I just went and signed up on Spoonflower. I love your speech balloons. Oh, this could be dangerous! Thanks for the heads up! And have fun sewing your very own creation! ohmigosh, this is fabulous – I always wanted to design my own fabric, but no design degree. Yours is soooo cute. I gotta look into this. Thanks for the tip and What will you make with it? I signed up AND I signed up my husband, the Renowned Local Artist, since he is the freaking KING of repeat patterns, mandalas and kaleidoscopes. Be afraid. I can see a line of fabrics in my future. This is such a great idea! I have so much trouble finding fabric that I like 100%. The fabric you designed is cool. I love the colors! Oh my goodness, this fabric is adorable – your caption about using colourful language made me laugh!And lazy milliner’s suggestion is surely a must, that’s such a brilliant idea…Dilly. Oh, wow! What a brilliant idea. I love your design. 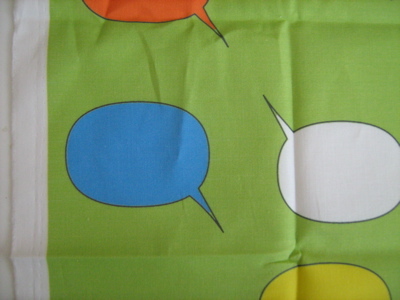 Speech bubbles, eh? Isn’t that just asking for trouble? I’m having a bit of a problem working out the scale. I want those bubbles to be huge, so unless you’re using a really, really large coin I’ll just have to wait and see what you make of it to get the whole picture! That is a very cool print. I would love to have the time and talent to design fabrics. This sure looks like it’s making it THAT much more accessible. Ouch–$90! I guess it’s really not that bad, when you think about it. I love what you’ve done, Erin. I’m really tempted to do this and I have basically zero talent–just ideas! Next Erin design: thought balloons? 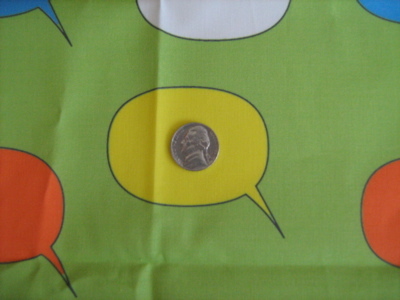 Having personal Spoonflower stores is a great idea! Not only will we be able to make the fabric of our dreams, but I’d love to be inspired by other people’s stuff. Isn’t that nice fabric? I’ve got a piece of it in the workroom, waiting for me to get my act together. It’s intended (right now, at least) for Vogue 1043, although that may change by the weekend, when I actually get to cutting it. Wow, can you imagine the stunt dresses you could create with that?!!! !For the amount of publicity you’re giving them, they should have given you the 5 yards of fabric for free! Oh that is SO cool! 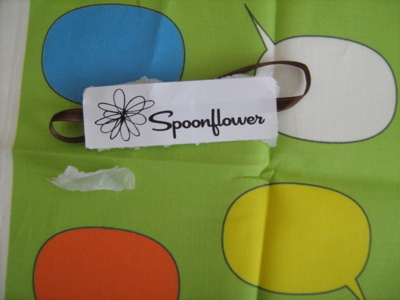 Thank you so much for letting me know about spoonflower – I can’t wait to try it! What a great idea! I’m always looking for fabric that I can’t find — this really is a brilliant idea.Thanks Erin! I look forward to seeing the dress this becomes!ps how big is that swatch? It looks like a yard of fabric! Thanks for the info about Spoonflower – I’d never heard of them and might have to give this a try. I love your fabric design – it’s such a happy fabric and I can’t wait to see what you do with it. Stephen from Spoonflower here:Erin, please keep us posted on how the wash-testing comes out. Thanks very much for posting the photos and helping break in our web site! Oh, Erin, you could make your gingko fabric! Love this one also. OMG, Spoonflower is brilliant!Posts like this are why I have 50-odd feeds and save yours for last. I just know I will be struck with a fit of inspiration and have to go sew.For those of us who’d use this service, finding a “this is a beta” message is like the days when people were auctioning off Gmail invites. WANT. WANT. WANT. How have I not picked up on this before now? waaah do I need an invite! !So you think the finish will wash out? I thought mercerization was supposed to be permanent? I’m looking forward to seeing what happens!! I LOVE this fabric design. Would like to see what you make out of it – and whatever it will be will be an eyecatcher. You know back when you wanted Tetris fabric? I was trying to figure out how to have it cascading down a skirt and lining up at the bottom, like in the game. Oh that is too cool by half ! !Oh dear. I need to win the lottery now….. So exciting. I love it! Sarah, “what ‘D’ does a lexicographer work with?”Dresses, of course! ;-)Erin, I love your fabric swatch. And, if Spoonflower does get personal shops set up, similar to that other North Carolina company they mention (Lulu books, I think), then you could turn your Dress A Day logo into fabric swatches for your readers to buy. We could make our own patch pockets to put on skirts! Or we could make skirt-shaped mini-purses; with pockets, of course! Thanks for posting this! I hadn’t heard of Spoonflower before but after reading this post yesterday I hightailed it over there and I got my invite this morning. I’m so excited. I’m planning to design some fabric to give to my mom for her birthday (which was, er, three days ago, but this will be worth the wait!). i can’t afford the spoonflower right now but i am a beta tester…only no money to test. sigh. oh i LOVE it! i’m going to send a few of my prints out to spoonflower as well…i’m still trying to figure out which one. but i do love how crisp and saturated yours came out! that’s so exciting! i’d love to see what you do with it! I have enjoyed looking at your site. I’ve never really taken to dressmaking because of horrible experiences with a needlework teacher. It is lovely to see the old patterns and know that they are still being put to good use! that is so cool, being able to print your own designed fabric! i’ve never heard of it, but i might just go and get some printed 🙂 have fun with your project! Such a fun fabric! Love the colors. Speaking of cute fabrics – did you see this super cute robot seersucker fabric? I finally see a robot clothing item in my future! I have never heard of this before – how is that possible? Soooo fun!! Thanks for the tip. I don’t have computer design know-how but I would love to learn. Going to look into it…. DUDE.You could, with sufficient planning, make fabric such that when you made the dress you planned, the pockets have printed flourishes. I love the idea of Spoonfeeder – it lets closet textile designers out of their hidey-hole and also gives people opportunities to create the fabric they have always wanted but never found. I love your design – I don’t think it’s stripey at all! I like your fab fabric! I have a design and an “in” at Spoonflower, but I don’t know how to scatter it. I have only tiled it and I’m not digging the results. I guess I’ll wait til I can just make my design really big or something. Must. get. more. skills.